Last summer I stayed 7 weeks in Thailand. It was my first time in the Southeast Asia and it was one of the best trips in my life. It was a backpacker trip with my girlfriend. Thailand is very cheap, 10 euros per day are enough most of the days. There are off the beaten track places and also touristic areas (we like to combine both). Thailand travels, of course, have some points to improve (weather, wild dogs, etc) but we can live with that. Which country (apart from Thailand) meet most of those criteria? Bali (an island of Indonesia) is similar to Thailand in all aspects. 10 Euros are basically 124.000 Rupiah. Native usually spends only 20.000 Rupiah for their lunch/dinner. It means You can live and eat like a king. Bali has a lot of beautiful beaches. Try to search for Nusa Dua/ Sanur beach in Google. Stay away from Kuta beach since it usually very crowded. Bali's main income is tourism. And most of the local able to speak English because of that. 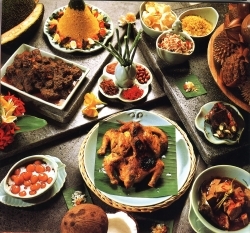 Bali provides various food from 32 provinces in Indonesia. And you can also find western/Japanese/US Fast food store here. Even the local are renting their motorbike. The country is big enough to stay 5-7 weeks. Indonesia is 3-4 times bigger than Thailand. You can also go to Lombok which less touristy using ship/boat from Bali. It's very near to Bali. Bali is the friendliest province in Indonesia. You can also see how friendly the native are in "Eat Pray Love" movie by Julia Roberts. Thai is well know of it's Buddhism culture. Meanwhile, Bali is well known of it's Hinduism culture. One suggestion though : Do not come during Nyepi ( a special day for Balinese ). On that day, Balinese usually stay at home, doing nothing - no one allowed to go outside the house. They also enforce the rule to the tourist. 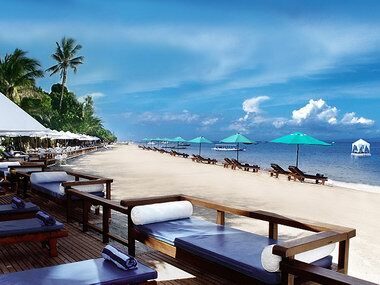 In case you really need to go during Nyepi, my advise is choose resort so you could still doing your activities inside the resort. Many Thai people vacation in Malaysia, it's not too expensive for them and they still feel at home there. So just as @MastaBaba suggested I would also suggest Malaysia. Many areas are very similar to Thailand and communication is not too much of a problem. Oh and you might poke in to Singapore while you're there to really fill up the meter for your "Touristic areas" point, I found restaurants in Geylang district of Singapore that are the same price as cheap Thai places. Living tend to be more expensive, but not a deal breaker I think. From a tourist perspective Singapore is worth a visit, and from a backpackers perspective it's not too expensive when you step away from the down town restaurants. Between Kuala Lumpur and Singapore there are very many coach companies running, many offer supreme comfort if you are willing to spend a little time getting there - and you get to see the nature while you're at it! I've used Easibook to find and book coach trips in Malaysia. They are mainly based in Singapore, but you can even go to/from Thailand with a bit of work. That said I would strongly recommend that you take a closer look at Indonesia, the friendliness of Thailand can be found here as well. In my experience the English is good and prices are not too far from what you're referencing if you look around a bit. I don't know too much about the Philippines but from what I hear it should not be too far from what you're looking for. Language wise I'm not sure, might be universal sign language at some of the more remote destinations. where you can find beach huts and laid back atmosphere. I even found some nice beaches in Vietnam but still not as laid back as Thailand and the others mentioned. Trivia: "pulau" is the Malay word for island and so is "ko" or "koh" the Thai word for island. In all three countries you can find budget accommodation whereas Malaysia is way more developed. While travelling Laos or Cambodia having a serious illness a flight to Bangkok is not far and mostly the best solution. I vouch for Indonesia too... check out Bali - it's nice, very beautiful and very friendly people. Hire a motorbike and ride around the whole island, it'll only cost you around $5 a day and its the best way to get around there. Then head across to Lombok, which is like Bali 20 years ago. It's much less touristy, but still has awesome attractions. Hike up Mt. Rinjani - one of the most amazing things I've done in my life (work on your fitness before though, its TOUGH but worth it). Head down South to Kuta beach which is a very popular surfer hangout with amazing beaches. Ride around the south coast and take in the huge cliffs dropping into the sea, and traditional villages along the way. Head up north to the Gili Islands for some relaxing, diving and socialising - it's the most touristy part of Lombok but i still love it. Fantastic diving up there, but even better down south around Sekotong and Belongas Bay - check out DiveZone if you're a diver (author is affiliated). Then you could either make a big overland journey through Sumbawa (lots of great surfing there too i hear, but not so easy to travel through - you'd need to hire a driver i believe), or take a 4 day boat ride around Sumbawa to Komodo. Check out the Komodo Dragons, and then go to Labuan Bajo. This is a super cool little town on the Western edge of Flores island. The diving in Komodo (done from LB) is the best I''ve ever done by a long shot (over 300 dives in maybe 15 different countries). Then if you still have time head east into Flores where they have amazing Volcanoes, lakes and wildlife... and the people on Flores are super frliendly and accommodating. If you had more time, you could even start your trip in Java - that'll add a good amount of time to your trip. Indonesia is amazing - so much variety in one country it'll never cease to amaze you. I have lived on Lombok for 5 months and never got bored of the place, its wonderful. Only Thailand is Thailand (duh! ), but you could try Malaysia, which comes pretty close in many ways. In fact, many of the countries of south east Asia have similar advantages. Every country is different and if you are looking for something like Thailand, then just go back to Thailand. However, if you want to discover other countries (which are different, for good or bad), then there are many countries to explore. However, starting with Thailand might have been bad luck, since it is very hard to beat the combination of friendliness, nature, inexpensive, and a rich local culture. At the same time, I wonder how much of Thailand did you actually see if you think that everyone can speak English. Most Thai people speak very little English. Likely you stayed in the heavily touristed areas. If that is the case, then stick with those places in other countries, such as Bali, Indonesia. You could also try India. The last part (sanitation & health), is maybe a bit variable depending on where you are but the rest (cost, beaches, food, motorbikes, size, English, places to see) would fit you perfectly. I suppose Sri Lanka is the same (though I've never been there), but much smaller. Not the answer you're looking for? Browse other questions tagged thailand where-on-earth southeast-asia or ask your own question. Is there any ferry to the south of Thailand from Vietnam or Cambodia? What is the cheapest way to get to Laos / Thailand from the UK?